Exposure: SII = 360 min. Ha = 360 min. OIII = 380 min. M17, also called the Swan Nebula and sometimes the Omega Nebula, is a region of star formation and shines by excited emissions caused by the high-energy radiation of young stars. However, unlike many other emission nebula, these stars are not obvious in optical images, but are hidden within the nebula. The nebula has been the site of very active star formation. 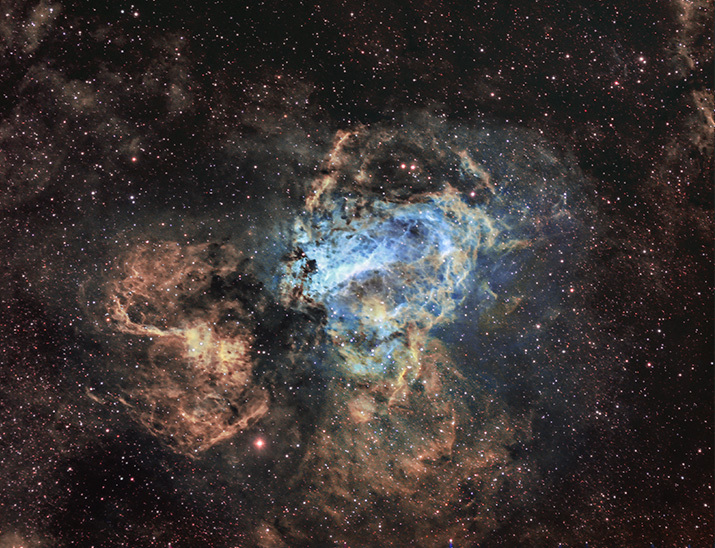 A cluster of about 35 bright, but obscured, stars are still imbedded within the nebulosity. In time the clouds of obscuring gas will be disapated and these, along with other newly formed stars, will become part of an open cluster of stars. The nebula contains a large amount of dark obscuring material comprised of dust and cold gas. The mass of the gas and dust in the Swan Nebula is estimated to be about 800 times that of the Sun. While the bright center portion of the nebula is roughly 15 light years across, the total total gaseous cloud, including low-luminosity material, extends to at least 40 light years. M17 lies in the constellation Sagittarius at an estimated distance of 5,000 to 6,000 light years from the Earth. 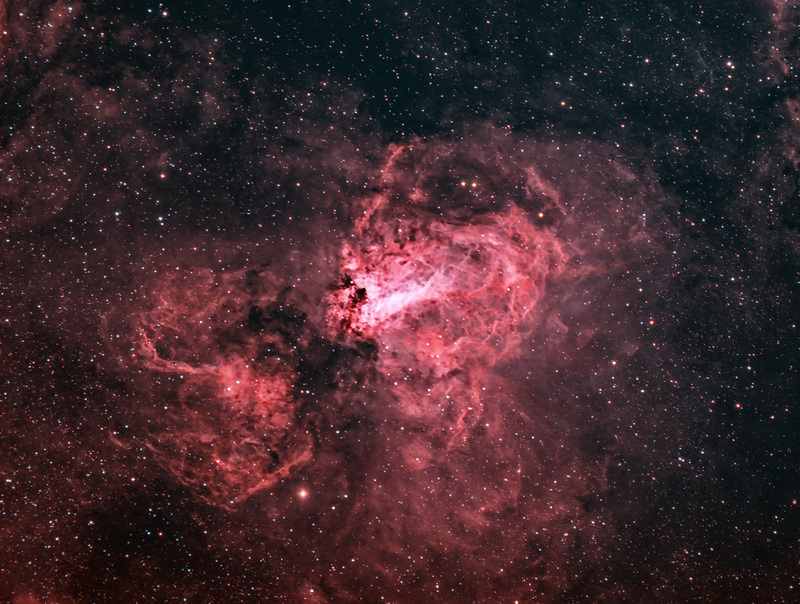 This image was assembled from narrowband data obtained through Sulphur II (SII), Hydrogen Alpha (Ha), and Oxygen III (OIII) narrowband filters. It was assembled as a false color image. SII was mapped to the Red channel, Ha was mapped to the Green channel, and OIII was mapped to the Blue channel. This mapping technique is known as the Hubble Palette. The stars were overlaid with data from a near true color Ha/OIII/OIII image.